Based on data released on Friday, July 21, 2017 by the BEA and adjusted to include all sales throughout the production process, nominal adjusted GO (GO*) increased at an annualized rate of 6.0% in the first quarter of 2017, which is just slightly lower than the previous quarter’s increase of 6.2%. Nominal adjusted GO for the first quarter of 2017 increased substantially faster than 3.3% GDP growth and faster than the 5.6% growth of the unadjusted GO reported by the BEA. Real GDP, the bottom line of national income accounting, rose at an annualized rate of 1.4% in the first quarter 2017. Real GO* continues to grow much faster at a 2.5% rate. The Skousen B2B Index, a measure of business spending throughout the supply chain, continued growing at a brisk pace in the first quarter 2017. This continued growth indicates a sustained business activity recovery that started in the fourth quarter 2016 following the November presidential election of Donald Trump and continued through the first quarter of President Trump’s administration. In the first quarter, B2B transactions rose at an annual rate of 6.6% in nominal terms or 3.12% in real terms. Over the past two quarters – Q4 2016 and Q1 2017 – business spending increased a total of 15%. 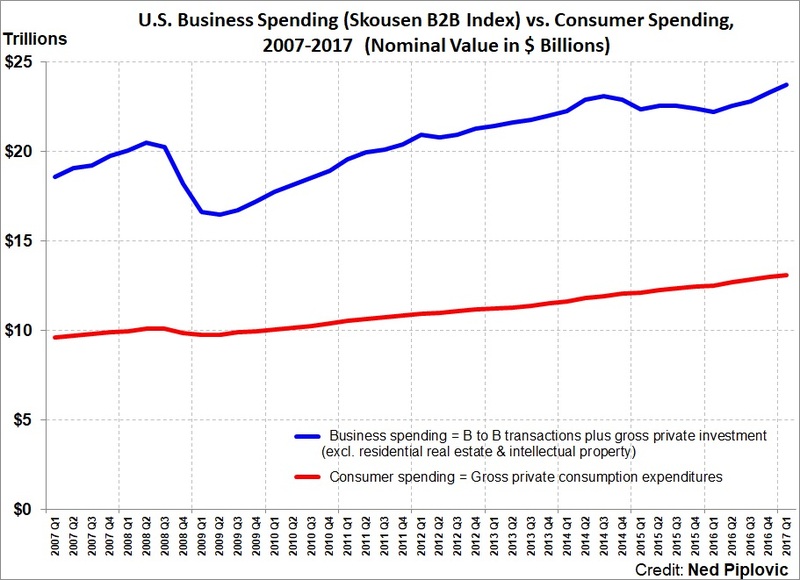 Last time that the Skousen B2B Index showed a business spending growth of 15% or more over two quarters was in the beginning of 2014. After breaking the $40 trillion mark for the first time in the previous quarter, adjusted GO rose to $41.2 trillion and reached another first by exceeding the $41 trillion mark in the first quarter 2017. The current adj. GO is more than double the size of GDP ($19 trillion), which measures final output only. The overall growth of GO resulted from the growth of almost all individual industries and sectors – especially industries in the early stages of production. Increased spending in the early stages, which tend to be leading economic indicators, is a good indication that the overall economy should continue expanding over the next few quarters. Out of the 29 Industries and sectors defined within GO, 26 sectors rose compared to the previous quarter. The mining sector followed a 30.2% annualized growth in the fourth quarter 2016 with a 62.7% boost in the first quarter 2017. However, the mining sector accounts for just 1% share of total GO, which diminishes the impact of this large increase on the overall GO. On the contrary, the manufacturing sector is almost a fifth of total GO (18% share). Therefore, the 6.3% annualized growth of the manufacturing sector has a much greater positive impact on the total GO. With a 9.6% annualized growth rate, non-durable goods outpaced durable goods, which rose at 4%. Compared to the previous quarter, spending fell in only three sectors. The largest drop of 12.7% is in the utilities sector. The arts, entertainment & recreation sector is down 3.6% and management of companies and enterprises fell 1.8%. However, these three sectors combined account for just 4.1% share of the total GO. Therefore, the negative performance of these few sectors could not dampen the continued growth of the GO overall. Total government spending (11% share of total GO) increased 3% in the first quarter. While that growth rate is not particularly high, it is 50% higher than the previous quarter’s growth rate of 2%. The federal government grew at an annualized rate of only 0.5% in nominal terms and state and local government grew at a significantly higher rate of 4.1%. Gross output (GO) and GDP are complementary statistics in national income accounting. GO is an attempt to measure the “make” economy; i.e., total economic activity at all stages of production, similar to the “top line” (revenues/sales) of a financial accounting statement. In April 2014, the BEA began to measure GO on a quarterly basis along with GDP. Gross domestic product (GDP) is an attempt to measure the “use” economy, i.e., the value of finished goods and services ready to be used by consumers, business and government. GDP is similar to the “bottom line” (gross profits) of an accounting statement, which determined the “value added” or the value of final use. GO tends to be more sensitive to the business cycle, and more volatile, than GDP. During the financial crisis of 2008-09, GO fell much faster than GDP, and afterwards, recovered more quickly than GDP. Still, it wasn’t until late 2013 that GO fully recovered from its peak in 2007. 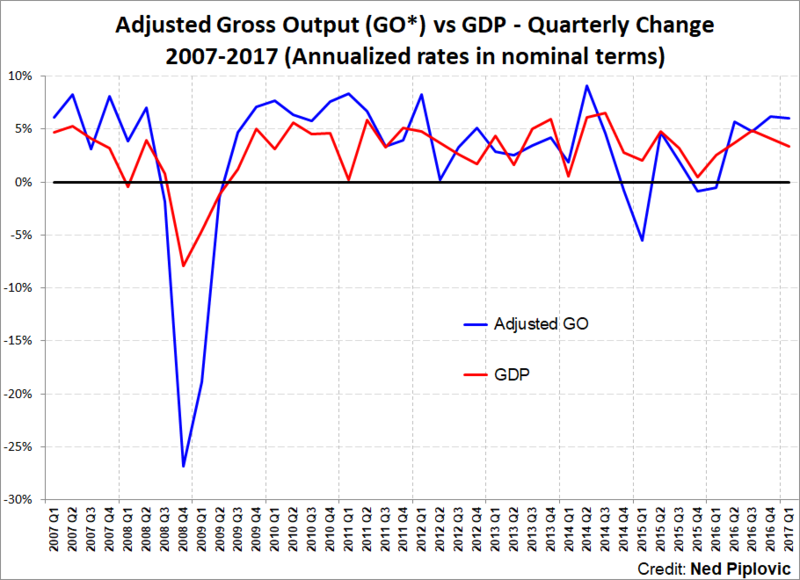 The fact that the adjusted GO continued to grow faster than GDP is a positive sign. We have also created a new business-to-business (B2B) index based on GO data. It measures all the business spending in the supply chain and new private capital investment. Nominal B2B activity increased 7.7% to $23.75 trillion. Meanwhile, consumer spending rose to $13.1 trillion in the first quarter, which is equivalent to a 3.4% annualized growth rate. In real terms, B2B activity rose at an annualized rate of 4.2% and consumer spending rose 1.5%. Skousen first introduced Gross Output as a macroeconomic tool in his work The Structure of Production (New York University Press, 1990). A new third edition was published in late 2015, and is now available on Amazon. The BEA’s decision in 2014 to publish GO on a quarterly basis in its “GDP by Industry” data is a major achievement in national income accounting. GO is the first output statistic to be published on a quarterly basis since GDP was invented in the 1940s. Note: Ned Piplovic assisted in providing technical data for this release. To interview Dr. Mark Skousen on this press release, contact him at mskousen@chapman.edu, or Ned Piplovic, Media Relations at skousenpub@gmail.com. The BEA currently uses a limited measure of total sales of goods and services in the production process. Once products are fabricated and packaged at the manufacturing stage, the BEA’s GO only adds “net” sales at the wholesale and retail level. Its official GO for the 2017 1st quarter is $33.3 trillion. By including gross sales at the wholesale and retail level, the adjusted GO is $41.2 trillion in Q1 2017. Thus, the BEA omits $7.9 trillion in business-to-business (B2B) transactions in its GO statistics. We include them as a legitimate economic activity that should be accounted for in GO, which we call Adjusted GO. See the new introduction to Mark Skousen, The Structure of Production, 3rd ed. (New York University Press, 2015), pp. xv-xvi. Today, on April 15 Tax Day, hundreds of thousands of citizens are protesting out of control government spending and taxes at Tea Parties across America. The good news is that marginal tax rates have gradually declined since the 1950s, when the rate on income was 90%. And taxes on long-term capital gains and dividends are now at 15%. Long live supply-side Reaganomics tax cuts. The bad news is that prior to the 1980s, there were plenty of loopholes to escape onerous 90% tax rates. Those tax shelters are largely gone. The good news is that Tax Freedom Day (the amount of days you have to work to pay Uncle Sam) arrived two days ago, on April 13, according to the Tax Foundation. This is eight days earlier than in 2008, and a full two weeks earlier than in 2007, due to the recession, and the large temporary tax cuts for 2009 and 2010. Moreover, if you add in the federal budget deficit to total taxes collected, the real Tax Freedom Day is May 29, the worst since World War II. But there’s more bad news: For American business, the corporate tax rate is 40% in the United States, 50% higher than the average size of other industrial countries. The average corporate tax rate in OECD countries has been falling over the past 20 years, but not in the U.S. In addition, legislators have discovered ingenious ways to taxing its citizens — through import duties, levies, and fees of various sorts. Today the federal “excise” tax is taking its toll on gasoline, tobacco, telephone and utility bills. And sales taxes are inevitably rising in state after state, and I know of no state that has cut sales taxes. After every recession, the governor “temporarily” raises the sales tax by a penny, but then never rescinds it. Moreover, the state legislators are always finding ways to expand the tax base. When I was in Florida recently, the state imposed its 6% sales tax on hotel parking fees! The few sales tax exemptions left, such as out-of-state and online purchases, are gradually disappearing. Not surprisingly, taxes at the federal, state and local level are at an all-time high as a percentage of GDP. And under President Obama’s tax increases on the wealthy and on average citizens through his “cap and trade” energy tax (which will raise substantially the price of gasoline and utility bills), the percentage is expected to reach 27%. Now more than ever, we need a stable, sound, low tax system that individuals and businesses can depend on for long term planning. Unfortunately, we change the tax law practically every year. Countries like Hong Kong do it right. For the past fifty years, they have not changed their tax code hardly at all. They have a flat tax of 18% on individuals and corporations, and no tax on interest, dividends and capital gains. And they live within their means. No wonder the Economic Freedom Index ranks Hong Kong #1 in the world in terms of economic freedom and economic growth. We could learn a lot from Hong Kong. I say, it’s time for a tax revolt. I favor a flat tax like the one advocated by Steve Forbes. It’s better than the so-called “fair tax” on consumption because it will create a new bureaucracy and will inevitably result in the U.S. having both a national sales tax and income tax. 1. Take advantage of all legitimate tax-advantaged strategies. The two best ones right now are (a) a Sub S corporate business, and (b) investing in real estate, including your own home. Both offer ways to minimize FICA and income taxes; both can benefit from tax credits. In fact, it’s the best “buyers” market in real estate I’ve seen in decades. 3. Do consider working abroad and taking advantage of the foreign earned income exemption for Americans. My wife and I lived and worked two years in the Bahamas in the 1980s and saved so much in taxes that we bought a second home in London. 4. Do NOT get involved in tax protest movements involving the refusal to file tax returns on Constitutional grounds, or suspicious offshore tax haven deals. You’ll end up losing money and perhaps going to jail. 5. Do NOT renounce your citizenship and move abroad. Recent tax legislation forces ex-patriates to pay taxes on the next 10 years of income. It also limits severely how much time you can spend in the United States. Finally, do NOT make business or investment decisions solely on the basis of avoiding taxes. There’s more to life than avoiding the tax man. Protest all your want today, but don’t make foolish financial decisions. “Behavioral” finance is the hot new field in the rapidly growing “imperial” science of economics. Consider the titles of recent books on the subject: Irrational Exuberance by Robert Shiller of Yale University, who correctly warned investors that the bull market on Wall Street in 2000 was not sustainable, and Why Smart People Make Big Money Mistakes by Gary Belsky and Thomas Gilovich. But the new behavioral economists go beyond the standard market approach. They argue that new institutional measures can be introduced to minimize error and misjudgments, without involving the government. At the American Economic Association meetings in Atlanta in January 2002, Richard Thaler of the University of Chicago presented a paper on his “SMART” savings plan, which is being tested by five corporations in the Chicago area. Thaler, author of The Winner’s Curse and a pioneer in behavioral economics, has developed a new institutional method to increase workers’ savings rates. Thaler noted that the average workers’ savings rates are painfully low. I blame the low rate on high withholding taxes, but Thaler suggested that part of the problem is the way retirement programs are administered. He convinced these corporations to adopt his plan to have their employees enroll in an “automatic” investment 401(k) plan. Most corporations treat 401(k) plans as a voluntary program and, as a result, only half choose to sign up. In Thaler’s plan, employees are automatically invested in 401(k) plans unless they choose to opt out. Result? Instead of 49 percent signing up (as they do in a typical corporate investment plan), 86 percent participate. In addition, Thaler has participating employees automatically invest most of any pay increase in higher contributions to their 401(k) plans, so they never see their paychecks decline, even though their 401(k) plans are increasing. Consequently, employees under this SMART plan have seen their average savings rate increase from 3 to 11 percent. Robert Shiller was a discussant at the session and rightly called Thaler’s plan “brilliant.” I agree. Having authored several investment books advocating “automatic investing” and dollar-cost-averaging plans,5 I applaud Professor Thaler for taking the concept of automatic investing to a new level. If companies everywhere adopt his plan, it could indeed revolutionize the world and lead not only to a much more secure retirement for workers but to a higher saving and investment rate. The result could be a higher economic growth and standard of living throughout the world. Most important, Thaler’s plan is a private-sector initiative and does not require government intervention. In short, through innovative management techniques and education, individuals can solve their own financial and business problems without the help of the state. 1. Lin Yutang, The Importance of Living (New York: John Day Company, 1937), p. 57. 2. References to “animal spirits” and “waves of irrational psychology” can be found in John Maynard Keynes, The General Theory of Employment, Interest and Money (New York: Macmillan, 1973 ), pp. 161–62. 4. Israel M. Kirzner, “Economics and Error” in Perception, Opportunity, and Profit (Chicago: University of Chicago Press, 1979), p. 135. 5. Mark and Jo Ann Skousen, High Finance on a Low Budget (Chicago: Dearborn, 1993) and Mark Skousen’s 30-Day Plan for Financial Independence (Washington, D.C.: Regnery, 1995). Mark Skousen is president of FEE. I came across a very interesting book the other day called Happiness and Economics: How the Economy and Institutions Affect Human Well-Being (Princeton University Press, 2002), by Bruno S. Frey and Alois Stutzer. It’s a very academic book, with lots of graphs and mathematical regressions, but the conclusions are pretty clear: “The general result seems to be that happiness and income are indeed positively related.” In other words, money can provide many benefits—more opportunities, higher status in society, the ability to travel, enjoy better food, housing, health care and entertainment, etc. I remember the day I discovered that I would be financially independent. It was a summer day in the 1970s when I came home and presented my wife with more than a dozen checks from a mail-order business I had started. Within a year, we had bought our first home, with 20% down, and by 1984, we had become successful enough that we could move our entire family (with four children) to the Bahamas to “retire.” The experience of becoming financially secure gave Jo Ann and me an incredible feeling of satisfaction. But the graph also indicates that more money provides diminishing returns in happiness. Subjective well-being rises with income, but once beyond a certain threshold, income has little or no effect on happiness. That’s why many wealthy people are not any happier than middle-class people. In fact, some wealthy people are downright unhappy. I once read a sermon by a church leader on the “Four Sources of Happiness.” He spoke of work, recreation, love and worship. I think he’s right. You have to find rewarding and honest employment to be happy. Unemployed people, not contributing to society or themselves, are generally unhappy. At the same time, people who spend too much time at the office and can’t relax with their family or friends at home need to learn the joy of recreation with a hobby, sports, travel or other avocation. Some of my most memorable times have been at a county softball game or a pick-up game of basketball with my kids or friends. Love and friendship are also key elements of happiness. Everyone needs someone to confide in, to spend time with, to learn from, to reminisce with, to love and be loved. For most people, love and friendship take time and effort. You have to work at developing friendships, but the rewards are never-ending. Finally, worship. Developing one’s spiritual side is essential to happiness. Some of my friends say they don’t need religion, but they are missing out on one of the joys of life—listening to a great sermon, singing hymns, meditating on the word of God and praying for God’s help. In short, there’s more to life than doubling your money on a hot stock (although that, too, gives a lot of pleasure). But Robert is attracted more to his best friend’s dad, a seat-of-the-pants entrepreneur who runs a series of businesses out of his rundown home. His adopted “rich” dad takes a riskier approach—forget about a traditional education and profession. Be a risktaker and a dealmaker! Drop out of school and start your own business. His “rich” dad even advises that a house is a liability that ties up seed capital that could be used in a new business opportunity. This “rich” dad has no time for leisure or sports; his passion is all business and making another deal. Robert rejects his “poor” dad’s conservative approach in favor of the high-risk adventures of the “rich” dad. He describes the thrill of victory and the agony of defeat going this route. Robert invests in income-producing real estate, business ventures and penny stocks. At one point in his mid-40s, he’s broke and sleeping in his car. But in the end, he reports, it pays off, and now he’s a multi-millionaire and a motivational speaker. I admire hardworking, self-made entrepreneurs who honestly provide a better product and become rich. But it’s a big mistake to recommend this high-risk approach to everyone. Not everyone is suited to be a swashbuckling adventurer; most in fact are better off working for others and investing in free enterprise through the stock market. Robert is wrong to criticize his father and his conservative investment strategies. There are many paths to the top of a mountain. Read George Clason’s Richest Man in Babylon. In the ongoing debate over the privatization of Social Security, one story has been over-looked: The private business sector in the United States has already faced the pension-fund problem and resolved it. Here’s what happened. After World War II, major U.S. companies added generous pension plans to their employee-benefit programs. These “defined benefit” plans largely imitated the federal government’s Social Security plan. Companies matched employees’ contributions; the money was pooled into a large investment trust fund managed by company officials; and a monthly retirement income was projected for all employees when they retired at 65. Management guru Peter F. Drucker was one of the first visionaries to recognize the impact of this “unseen revolution,” which he called “pension fund socialism” because this Social Security look-alike was capturing a growing share of investment capital in the United States.2 Drucker estimated that by the early 1990s, 50 percent of all stocks and bonds were controlled by pension-fund administrators. But Drucker (who doesn’t miss much) failed to foresee a new revolution in corporate pensions—the rapid shift toward individualized “denned contribution” plans, especially 401(k) plans. Corporate executives recognized serious difficulties with their traditional “defined benefit” plans, problems Social Security faces today. Corporations confronted huge unfunded liabilities as retirees lived longer and managers invested too conservatively in government bonds and blue-chip “old economy” stocks. Newer employees were also angered when they changed jobs or were laid off and didn’t have the required “vested” years to receive benefits from the company pension plan. Unlike Social Security, most corporate plans were not transferable. The Employment Retirement Income Security Act (ERISA), passed in 1974, imposed regulations on the industry in an attempt to protect pension rights, but the headaches, red tape, and lawsuits grew during an era of downsizing, job mobility, and longer life expectancies. The new corporate solution was a spin-off of another legislative invention—the Individual Retirement Account (IRA). The 401(k) rapidly became the business pension of choice, and there is no turning back. These “defined contribution” plans solve all the headaches facing traditional corporate “defined benefit” plans. Under 401(k) plans, employees, not company officials, control their own investments (by choosing among a variety of no-load mutual funds). Corporations no longer face unfunded liabilities because there is no guaranteed projected benefit. And workers and executives have complete mobility; they can move their 401(k) savings to a new employer or roll them over into an IRA. According to recent U.S. Labor Department statistics, there are about nine times more defined-contribution plans than defined-benefit plans. Almost all of the major Fortune 500 companies have switched to defined-contribution plans or hybrid “cash-balance” plans. Companies that still operate old plans include General Motors, Procter and Gamble, Delta Airlines, and the New York Times Company. IBM, a company that once guaranteed life-time employment, switched to a “cash-balance” plan two years ago, giving its 100,000 employees individual retirement accounts they can take with them in a lump-sum if they leave the company before retirement (long-service workers are still eligible for IBM’s old defined-benefit plan). But virtually all “new economy” companies, such as Microsoft, AOL, and Home Depot, offer 40 l(k) plans only. Congress could learn a great deal studying the changes corporate America has made in pension-fund reform. In fact, Social Security is in a worse position than most corporate plans were. Since less than a fourth of all contributions go into the Social Security “trust fund,” the government program is more a pay- as-you-go system than a defined-benefit plan, where most of the funds go into a corporate managed trust fund. As a result, the unfunded liability, or payroll-tax shortfall, exceeds $20 trillion over the next 75 years. To pay for so many current recipients, Congress has had to raise taxes repeatedly to a burdensome 12.4 percent of wages, and payroll taxes will need to be raised another 50 percent by the year 2015 to cover the growing shortfall.3 Few corporate plans require such high contribution levels. 1. Peter F. Drucker, “The Sickness of Government,” in The Age of Discontinuity (New York: Harper, 1969), pp. 229, 236. 2. Peter F. Drucker, The Unseen Revolution: How Pension Fund Socialism Came to America (New York; Harper & Row, 1976). This book was reprinted with a new introduction as The Pension Fund Revolution (New Brunswick, N.J.: Transaction, 1996). 3. Andrew G. Biggs, “Social Security: Is It a Crisis that Doesn’t Exist?” Cato Social Security Privatization Report 21 (www.cato.org), October 5, 2000, p. 3. What If Social Security Was Like a 401(k)? In the ongoing debate over the privatization of Social Security, one story has been overlooked: The private sector in the United States has already solved its own pension fund crisis by converting their old “defined benefit” plans into individualized 401(k)s.
Here’s the story: After World War II, major U.S. companies added generous pension plans to their employee benefit programs. These “defined benefit” plans largely imitated the federal government’s Social Security plan. Companies placed funds into a large investment pool based on employees’ salaries, the trust fund was managed by company officials, and a monthly retirement income was projected for all employees when they retired at age 65. But over the years, corporate executives recognized serious difficulties with their traditional pension plans, similar to the problems Social Security faces today. Corporations confronted huge unfunded liabilities as retirees lived longer and managers invested too conservatively in government bonds and blue-chip “old economy” stocks. Newer employees were also angered when they changed jobs or were laid off and didn’t have the required “vested” years to receive benefits from the company pension plan. Unlike Social Security, most corporate plans were not transferable. The Employment Retirement Income Security ACT (ERISA), passed in 1974, imposed regulations on the industry in an attempt to protect pension rights, but the headaches, red tape and lawsuits grew during an era of downsizing, job mobility and longer life expectancies. The new corporate solution was a spin-off of another legislative invention-the Individual Retirement Account (IRA). The 401(k) rapidly became the business pension of choice, and there is no turning back. These “defined contribution” plans solve all the headaches facing traditional corporate “defined benefit” plans. Under 401(k) plans, employees, not company officials, control their own investments (by choosing among a variety of no-load mutual funds). Corporations no longer face unfunded liabilities because there is no guaranteed projected benefit. And workers and executives have complete mobility; they can move that, 401k savings to a new employer or roll it over into an IRA. According to recent Labor Department statistics, there are about nine times more defined-contribution plans than defined-benefit plans. Almost all of the major Fortune 500 companies have switched to 401(k) plans or hybrid “cashbalance” plans. Companies that still operate old plans include General Motors, Procter & Gamble, Delta Airlines and The New York Times Company. IBM, a company that once guaranteed lifetime employment, switched to a “cashbalance” plan two years ago, giving its 100,000 employees an individual retirement account that they can take with them in a lump sum if they leave the company before retirement (long-service workers are still eligible for IBM’s old defined-benefit plan). But virtually all “new economy” companies, such as Microsoft, AOL and Home Depot, offer 401(k) plans only. Congress could learn a great deal studying the changes corporate America has made in pension fund reform. Converting Social Security into personal investment accounts is a step in the right direction, a policy change already achieved in Chile and other nations. Unfortunately, government – unlike business – is not prone to innovation. As Peter Drucker notes, “Government can gain greater girth and more weight, but it cannot gain strength or intelligence.” Hopefully, Bush will prove me wrong. Death of Leader, Communist Party USA: Two months ago, Gus Hall, 90, longtime leader of the Communist Party USA died. In reading Hall’s life story in The New York Times, I was reminded of my father’s own story as an FBI agent in the 1940s, when he was an undercover agent and spied on Gus Hall in Cleveland, Ohio. In 1948, Hall was convicted of espionage under the Smith Act and spent eight years in prison. My father, Leroy Skousen, lived a fascinating life as a missionary, FBI agent, lawyer, and anticommunist speaker. His life has been written up in a book titled Thunder Broke the Heavens, available from Skousen Publishing Co., P.O. Box 2488, Winter Park, Florida 32790, $20 postpaid (checks/cash only).